From the author of the best-selling memoir An Unquiet Mind, comes the first major book in a quarter century on suicide, and its terrible pull on the young in particular. 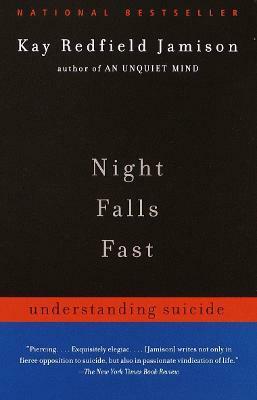 Night Falls Fast is tragically timely: suicide has become one of the most common killers of Americans between the ages of fifteen and forty-five. An internationally acknowledged authority on depressive illnesses, Dr. Jamison has also known suicide firsthand: after years of struggling with manic-depression, she tried at age twenty-eight to kill herself. Weaving together a historical and scientific exploration of the subject with personal essays on individual suicides, she brings not only her remarkable compassion and literary skill but also all of her knowledge and research to bear on this devastating problem. This is a book that helps us to understand the suicidal mind, to recognize and come to the aid of those at risk, and to comprehend the profound effects on those left behind. It is critical reading for parents, educators, and anyone wanting to understand this tragic epidemic.